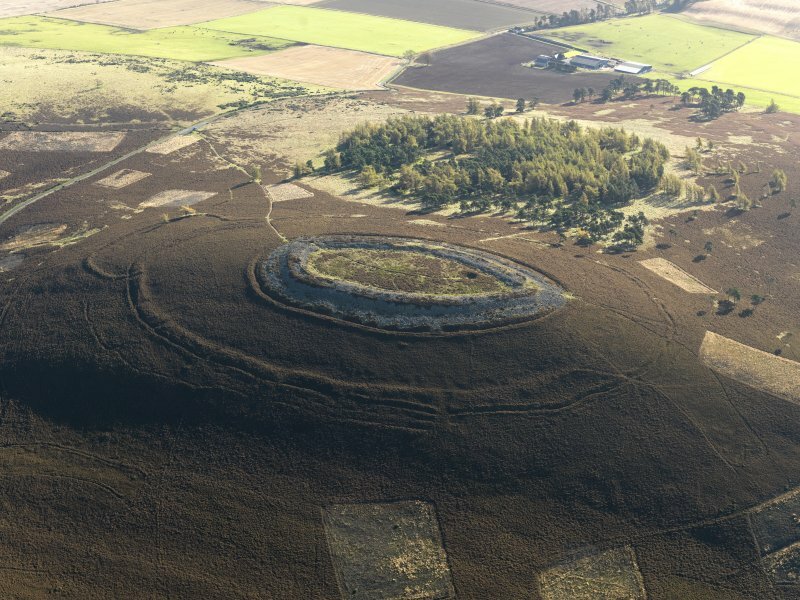 Oblique aerial view centred on the remains of the fort, taken from the SSE. 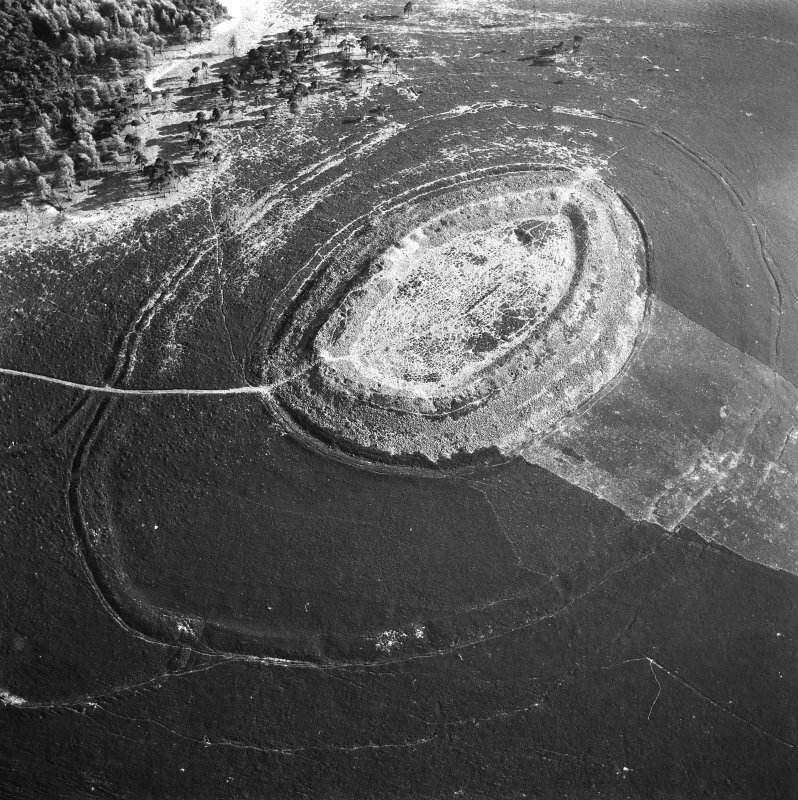 Oblique aerial view centred on the remains of the fort at White Caterthun. 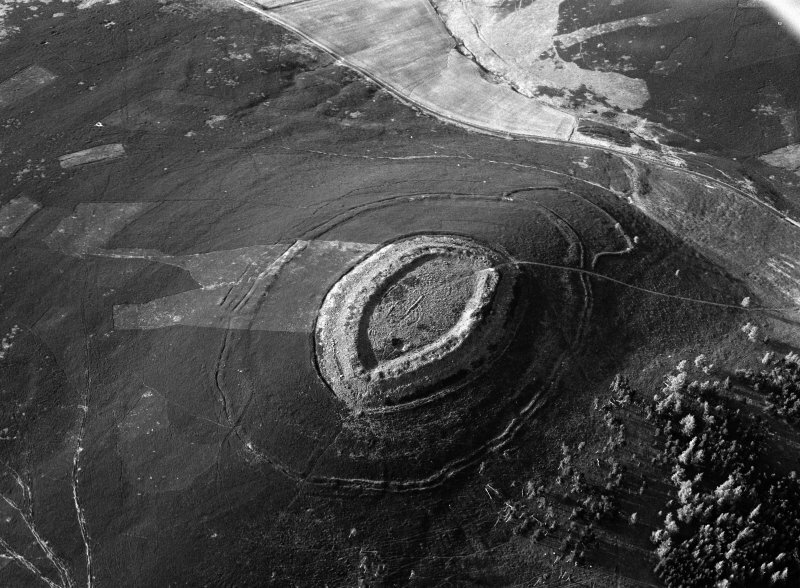 Oblique aerial view centred on the remains of the fort, taken from the NW. 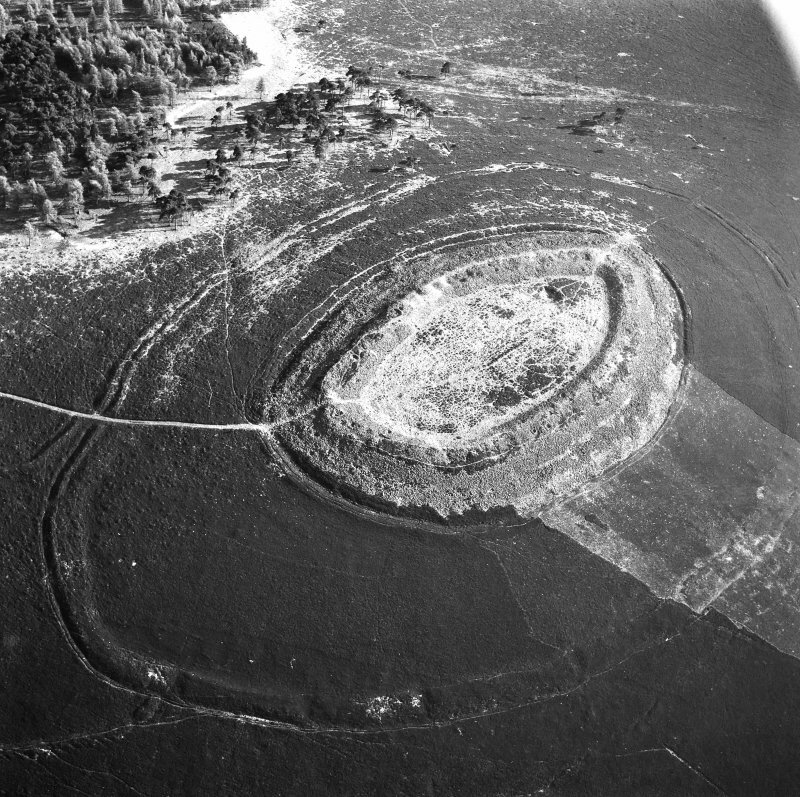 Oblique aerial view centred on the remains of the fort, taken from the WNW. 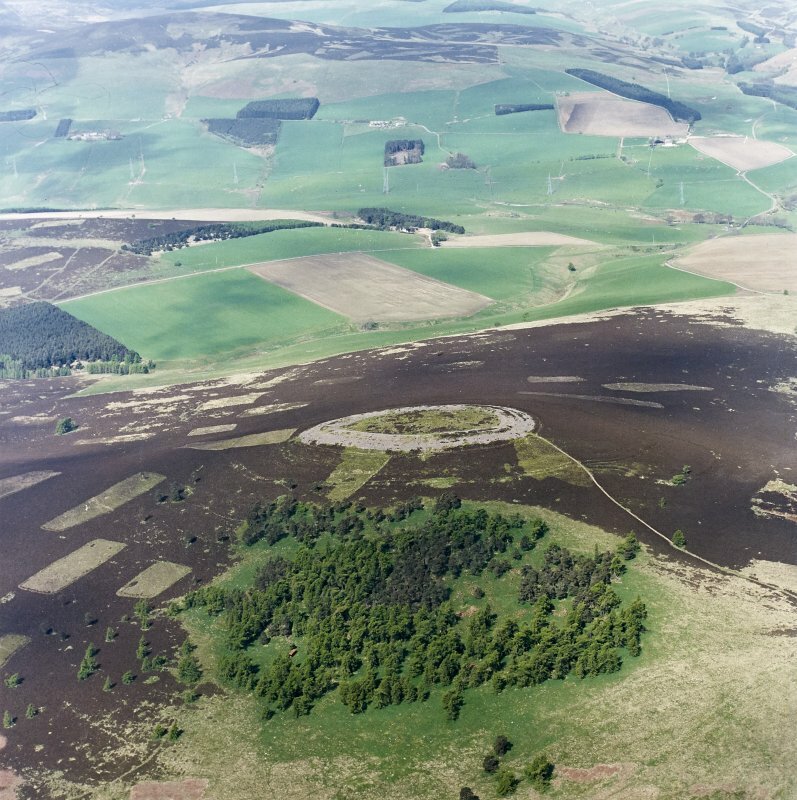 Oblique aerial view of Brown Caterthun centred on the remains of a fort with the remains of White Caterthun fort in the background, taken from the NE. 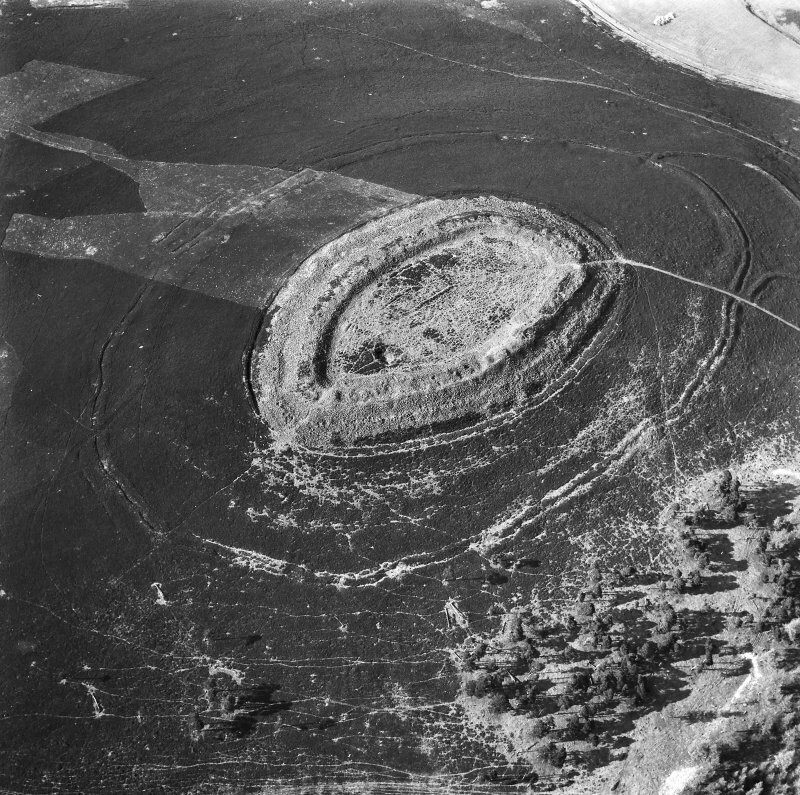 Oblique aerial view centred on the remains of the fort, taken from the SE. Oblique aerial view of White Caterthun centred on the remains of a fort with the remains of the Brown Caterthun fort in the background, taken from the SW.
Oblique aerial view of White Caterthun centred on the remains of a fort, taken from the W.
Oblique aerial view centred on the remains of the forts at Brown Caterthun and White Caterthun. 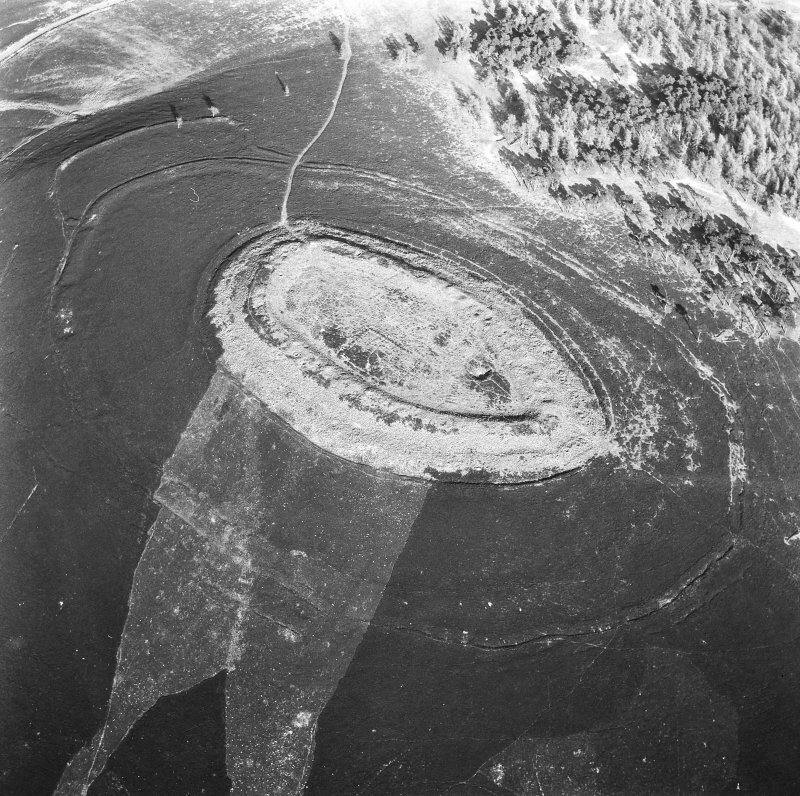 Oblique aerial view centred on the remains of the fort, taken from the ENE. 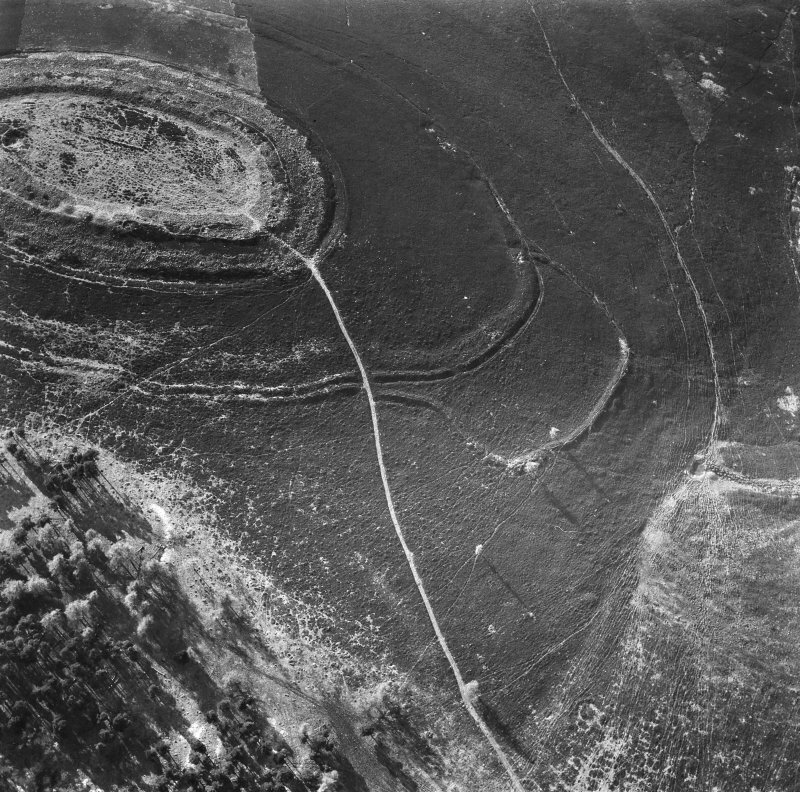 Oblique aerial view centred on the remains of the fort at White Caterthun, looking to the SE. 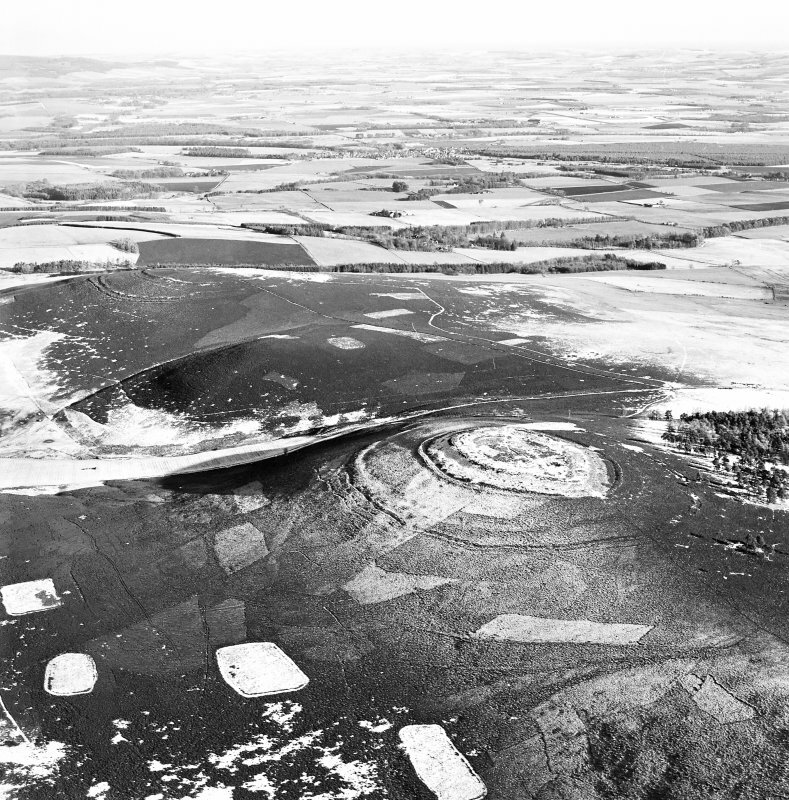 Oblique aerial view centred on the cropmarks of roundhouses and a rectangular enclosure within the White Caterthun fort with the remains of an unenclosed settlement adjacent, looking to the NNE. 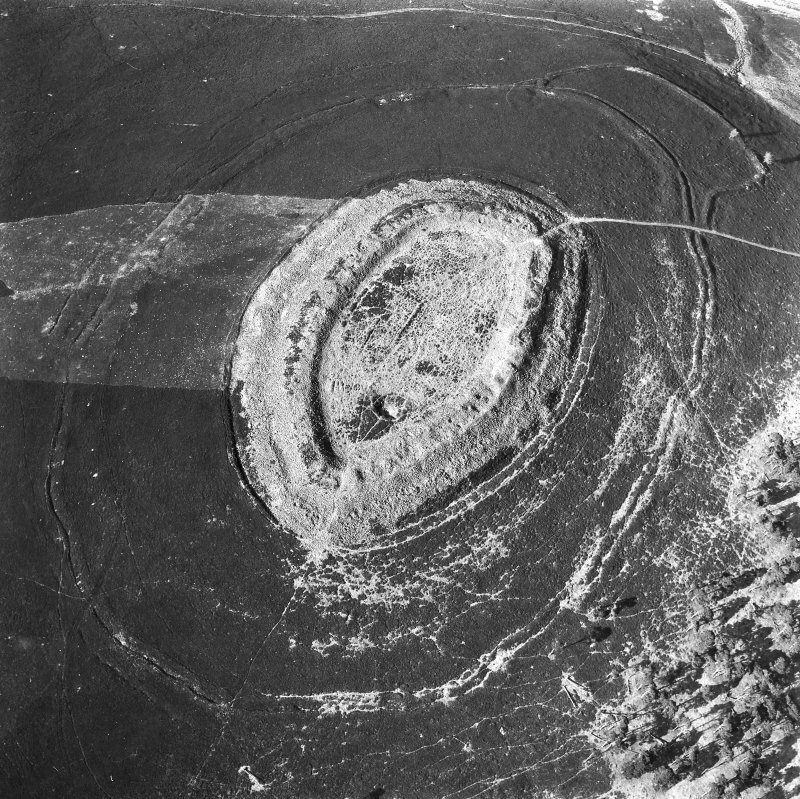 Oblique aerial view centred on the remains of the fort, taken from the ESE. 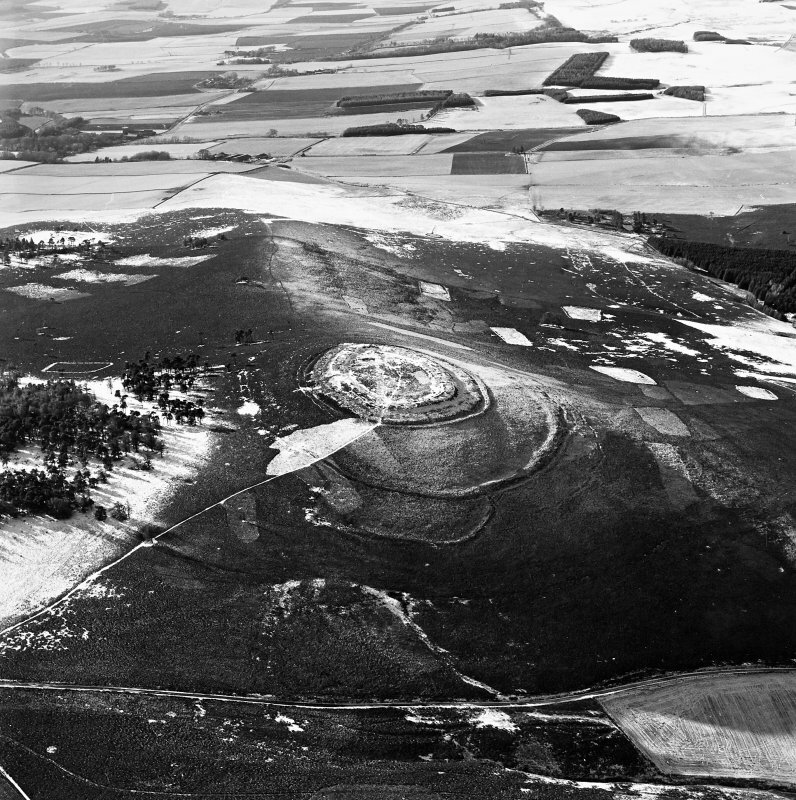 Oblique aerial view of White Caterthun centred on the remains of a fort, taken from the NW. 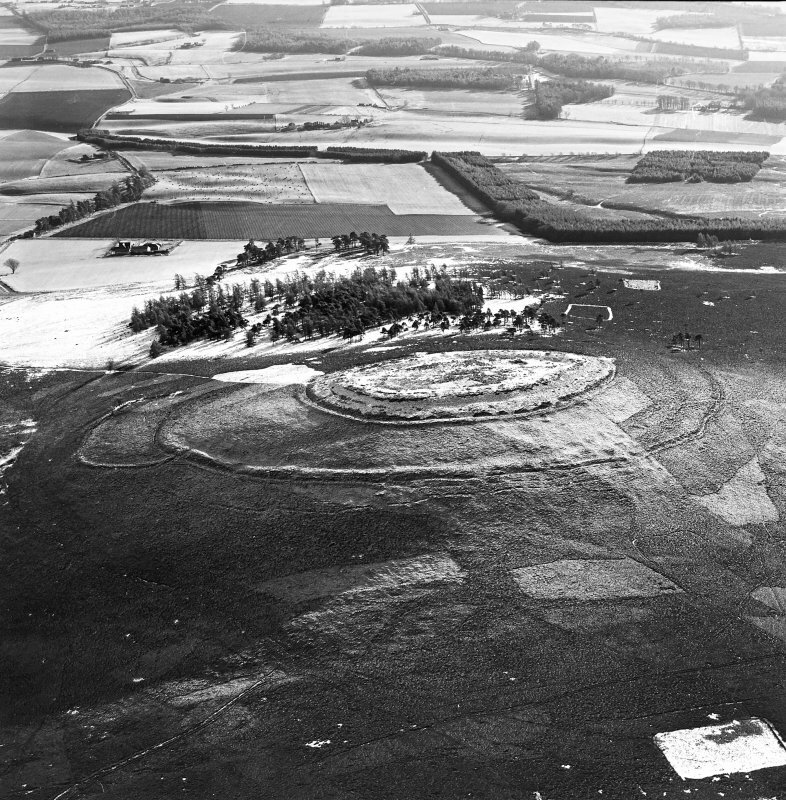 Oblique aerial view of White Caterthun centred on the remains of a fort, taken from the NE. Oblique aerial view of White Caterthun centred on the remains of a fort with the remains of Brown Caterthun fort in the background, taken from the SW.
General oblique aerial view of the White Caterthun fort with the Brown Caterthun beyond, looking to the NNE. 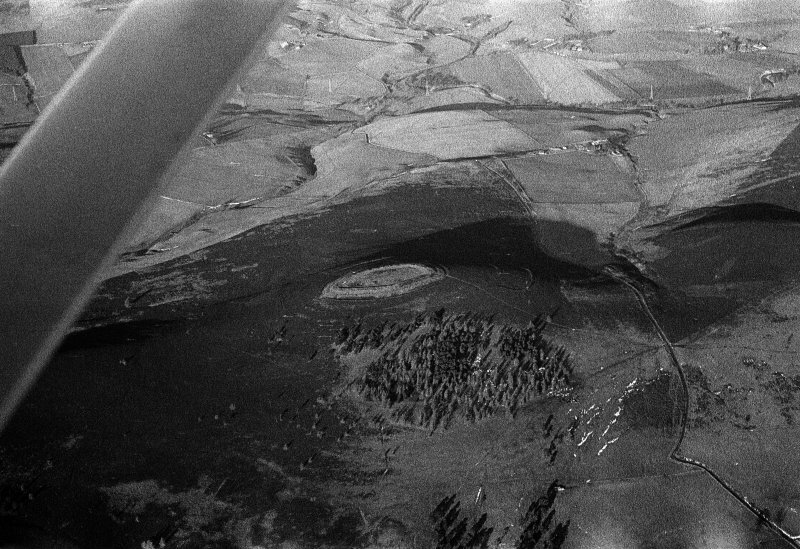 Oblique aerial view centred on the remains of the fort, taken from the N.
Excavation photographs: tumbled stone, ditch and counterscarp bank of multivallate fort, White Caterthun. 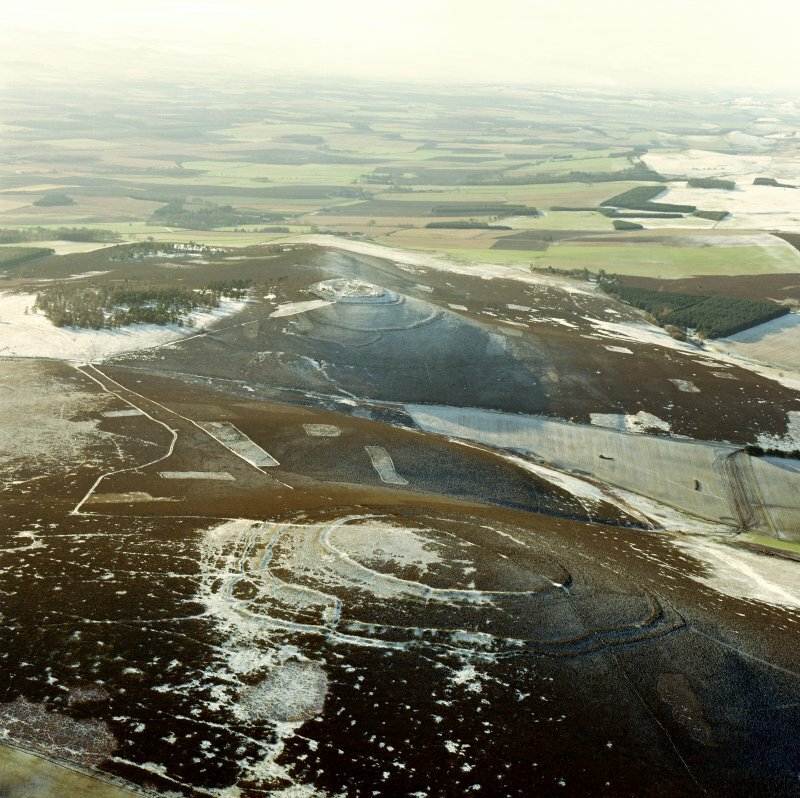 Oblique aerial view centred on the cropmarks of roundhouses and a rectangular enclosure within the White Caterthun fort with the remains of an unenclosed settlement adjacent, looking to the NW. Oblique aerial view of White Caterthun centred on the remains of a fort with the remains of the Brown Caterthun fort in the background, taken from the WSW. 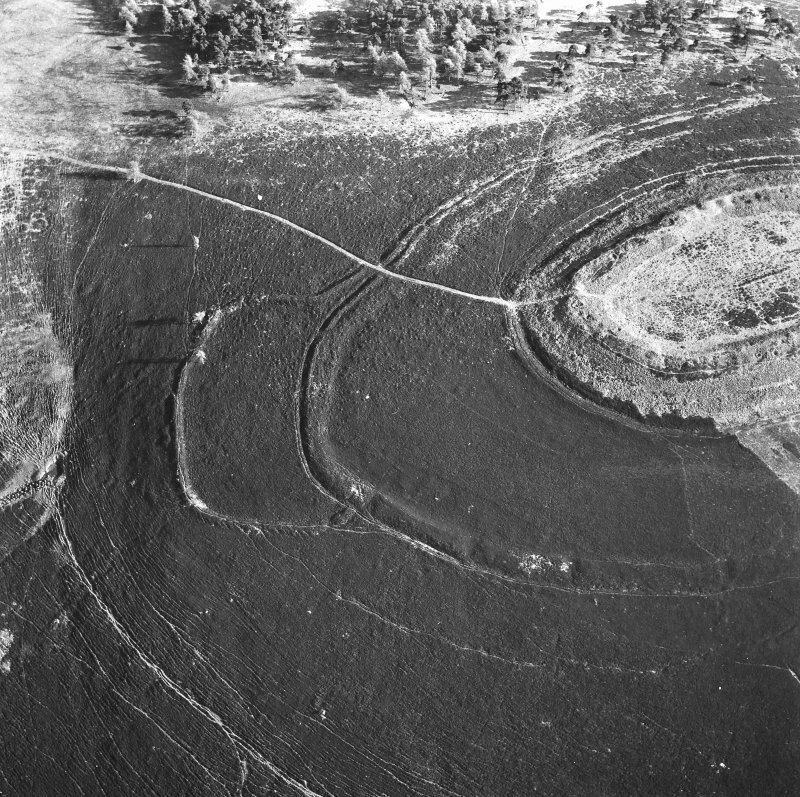 Oblique aerial view centred on the remains of the fort at White Caterthun, looking to the NW. 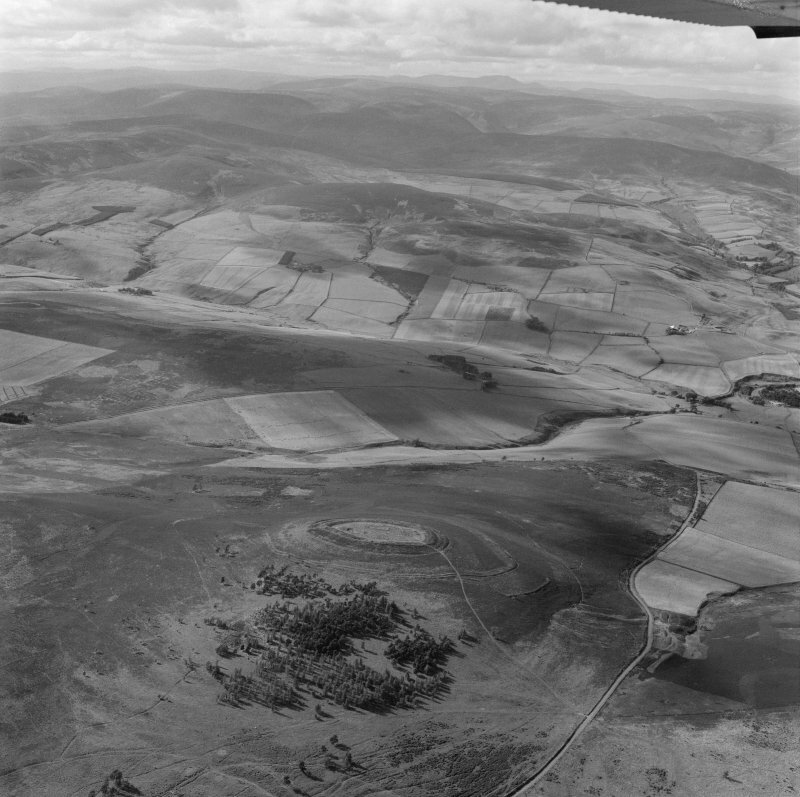 Oblique aerial view centred on the remains of the fort, taken from the NNW. 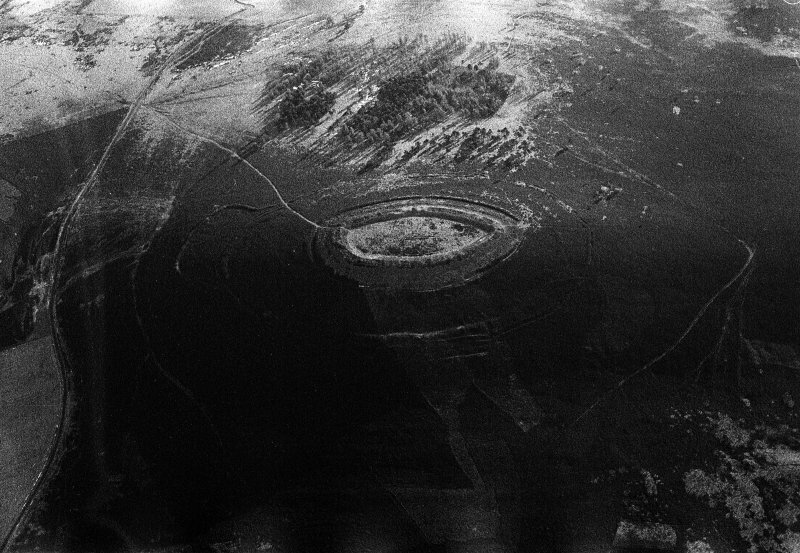 Oblique aerial view centred on the remains of White Caterthun fort, taken from the E.
General oblique aerial view centred on the remains of the forts, taken from the SW.
Oblique aerial view centred on the cropmarks of roundhouses and a rectangular enclosure within the White Caterthun fort, looking to the SSW. Oblique aerial view of White Caterthun centred on the remains of a fort with the remains of Brown Caterthun fort in the background, taken from the WSW. 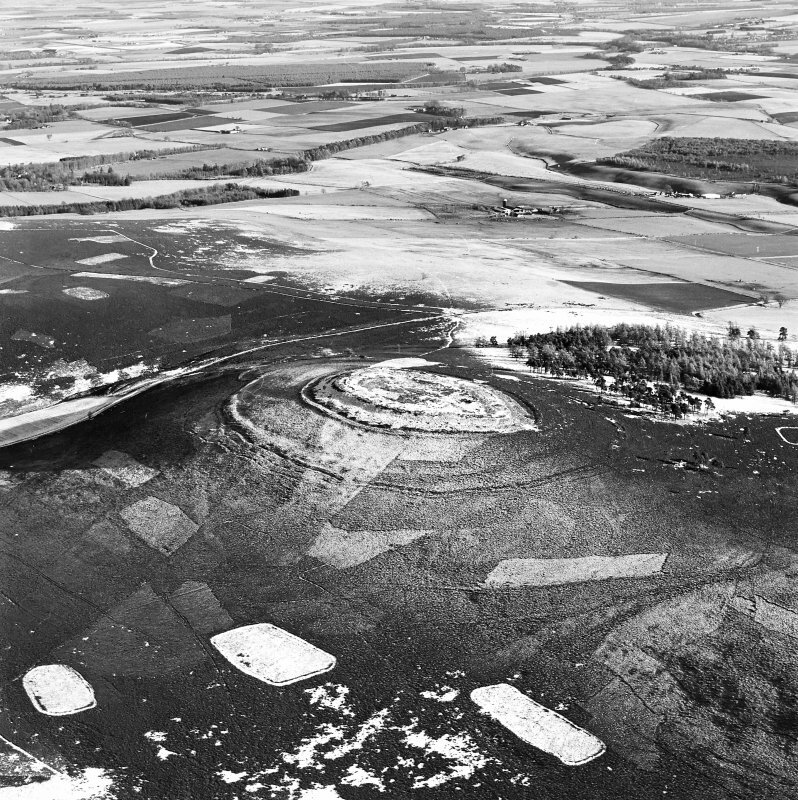 General oblique aerial view centred on the remains of the forts, taken from the ENE. 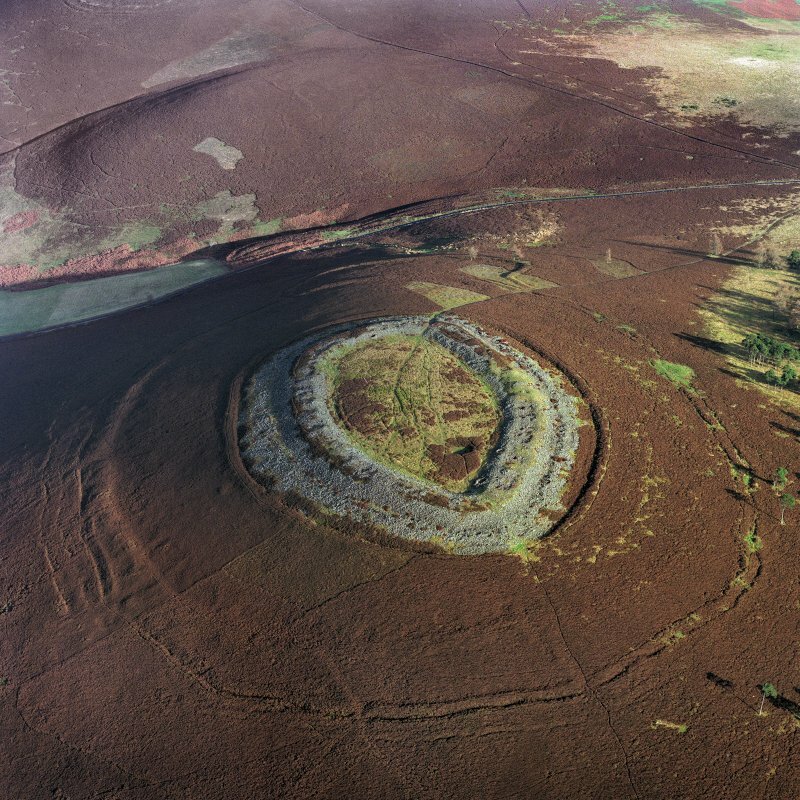 Oblique aerial view centred on the remains of the fort at White Caterthun, looking to the NE. 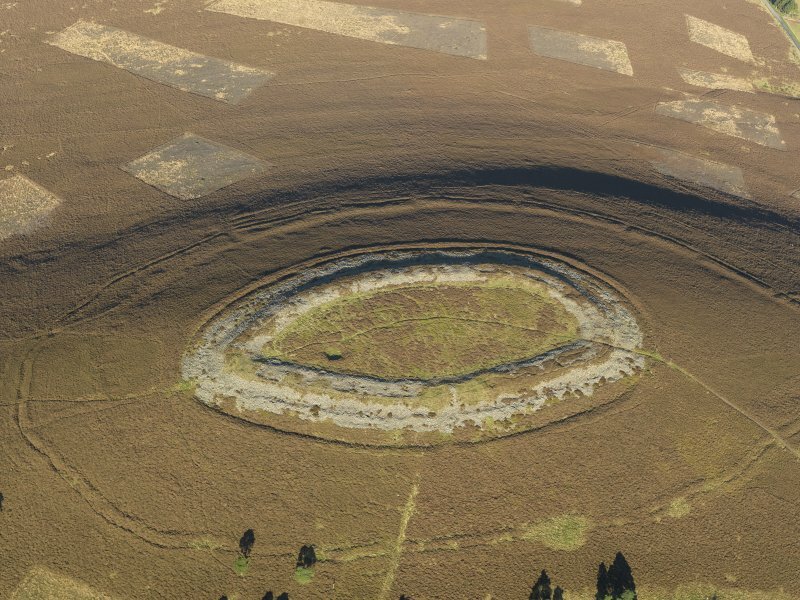 Oblique aerial view centred on the remains of ring ditch houses at White Caterthun, looking to the E.
Oblique aerial view centred on the cropmarks of roundhouses and a rectangular enclosure within the White Caterthun fort with the remains of an unenclosed settlement adjacent, looking to the S.
Oblique aerial view of White Caterthun centred on the remains of a fort, taken from the NNE. 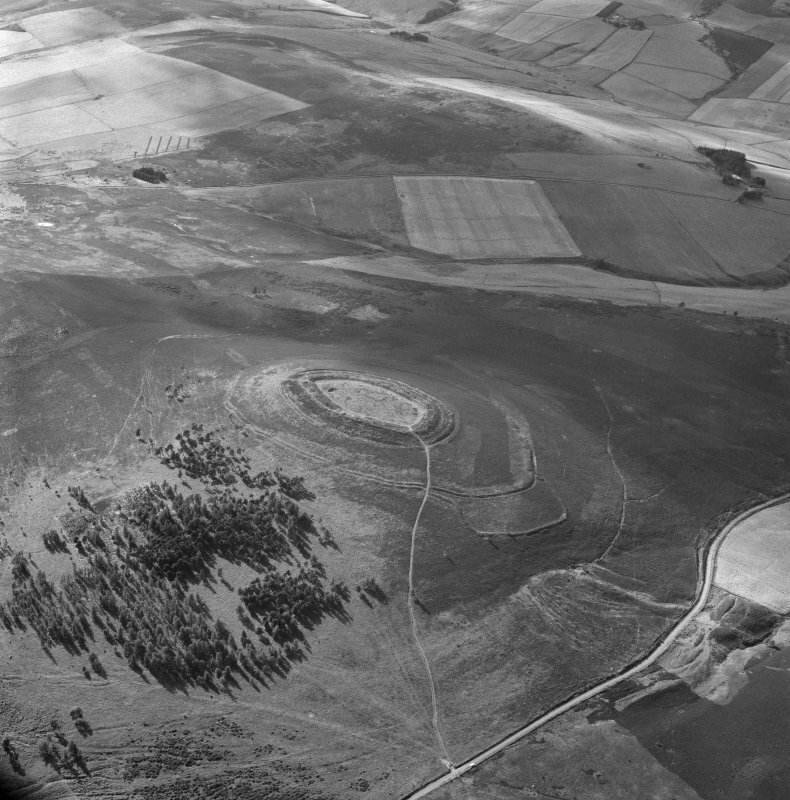 Oblique aerial view of White Caterthun centred on the remains of a fort, taken from the E.
Oblique aerial view of the White Caterthun fort, looking to the NNE. 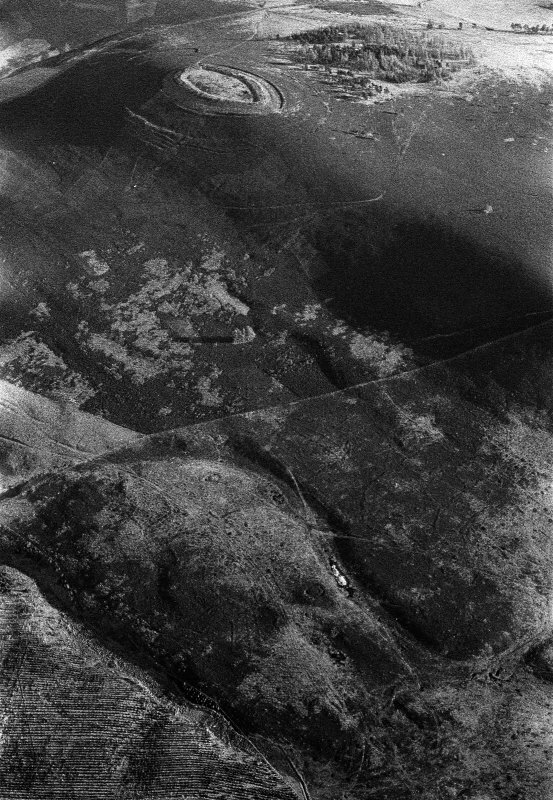 General oblique aerial view centred on the remains of ring ditch houses at White Caterthun, looking to the NNE. NO56NW 17 5473 6607 to 5467 6602. An Iron Age fort consisting of a double stone wall, probably timber-laced, with earthen outer defences. 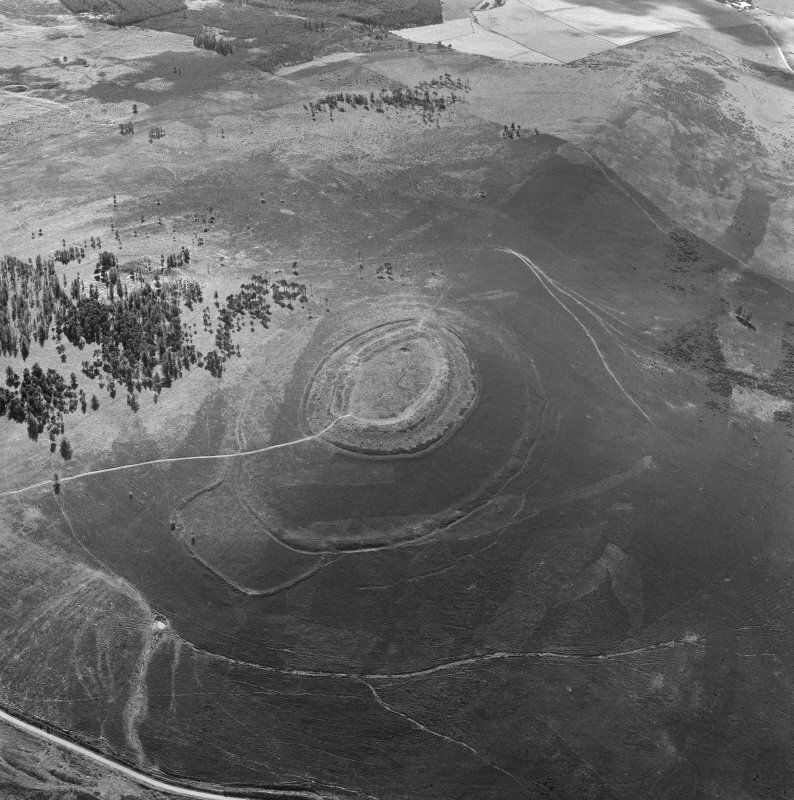 The inner wall, which probably measured about 40' in thickness, has an entrance on the SE, and encloses an area 500' by 220', in which are a well, probably contemporary with the fort, and a relatively modern, rectangular structure of turf. Feachem makes no mention of the "circular foundations", noted by King, within the fort. Immediately outside the outer stone wall is a low rampart with an internal quarry ditch, while at distances varying from 100' to 230' outside this are the remains of two ramparts with an annexe on the NE. Traces of two additional, probably incomplete, ramparts, unnoted by Christison, lie to the NW. While there is no evidence to show that the various defences represent more than one period, finds include a flint knife, a stone macehead (both in the NMAS) leaf-shaped and barbed-and-tanged arrowheads, a carved stone ball, two bronze flanged axes and "gold medals", one of which bore, on one side, the letter "B R E" round a head, and, on the other, "L C S A T D" around the figure of a bird. A broken cup marked stone lies on the west side of the fort, between the outer stone wall and the inner earthen rampart. R W Feachem 1963; D Christison 1900; E King 1799; NMAS Accessions catalogue; Information from F A Ferguson January 1954.
annexe on the NE has no ditch, and may be a later addition. The additional ramparts on the NW were not located. 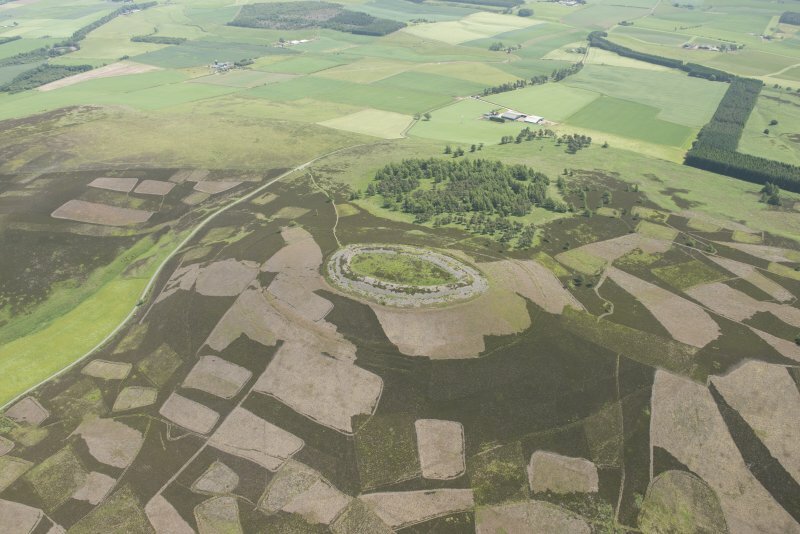 The interior of the fort is heather-covered, with the site of the well showing as a hollow 3.0m deep. The cup marked boulder was identified at NO 5467 6602. The broken pieces have been re-joined with metal clamps and it now measures 2.0m x 1.0m x 0.4m high and bears about 70 cups marks from 1" x 2" in diameter. Visited by OS (JLD) 16 July 1958. Generally as described. No 'circular foundations' were seen within the fort. Visited by OS (WDJ) 4 September 1967. Two cup-marked stones have been found on the White Caterthun. One lies on the W side of the fort below the inner rampart, and has about eighty cups on its upper surface. The other was discovered among tumble in the fort ditch; it bears a single cupmark and is now in St Andrews University Archaeological Museum. 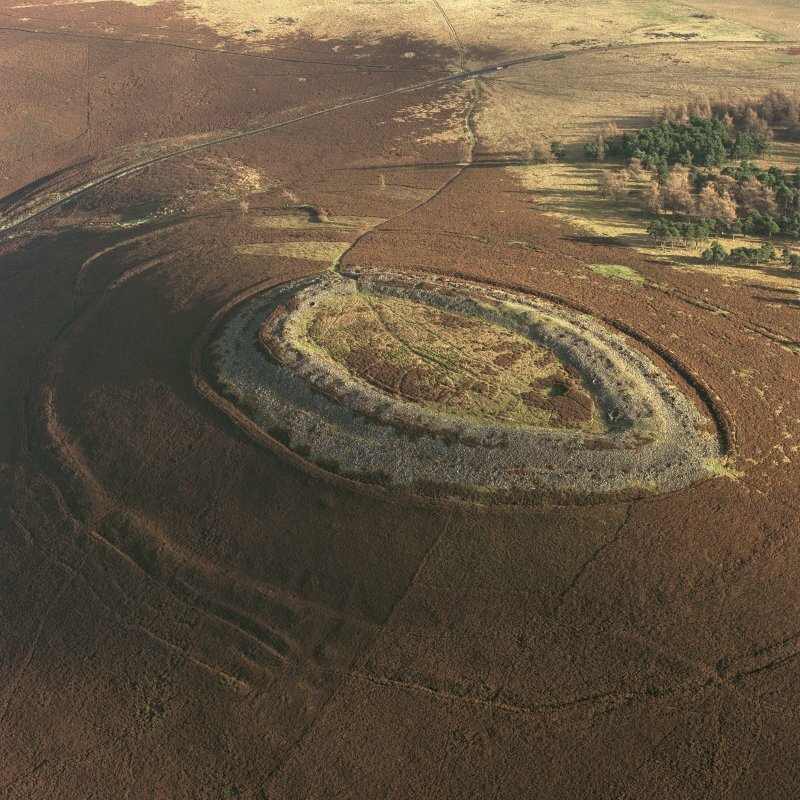 This complex fort is situated on the summit of White Caterthun Hill about 700m SW of Brown Caterhun fort (NO56NE 1). 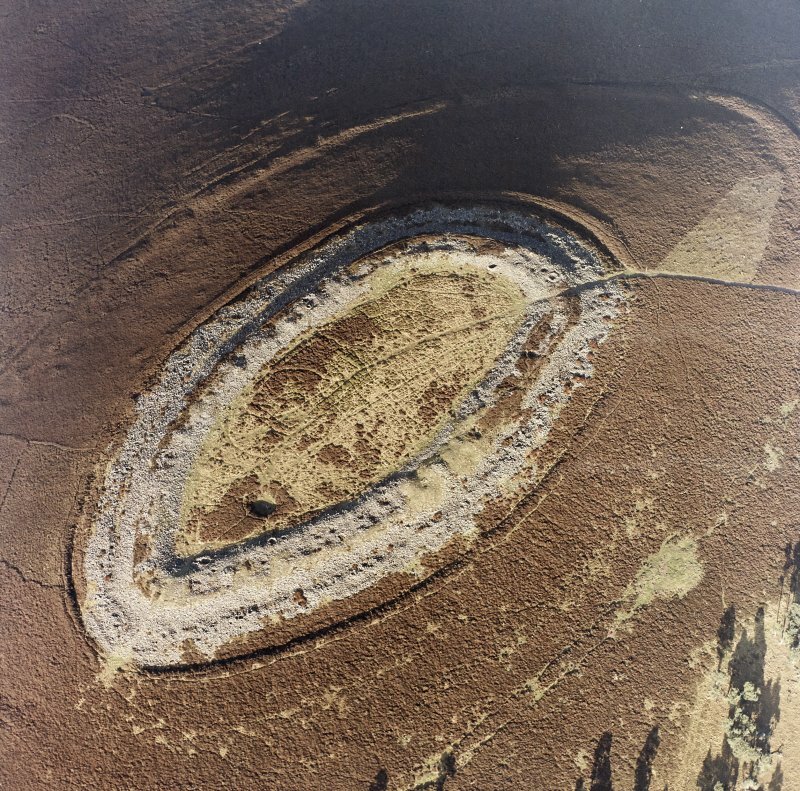 It is oval, measuring 140m by 61m within two stone walls; the inner wall is massive and measures 12m in thickness by up to 3m in height, while the outer is 6m thick. Immediately outside the walls there is a rampart with an internal quarry-ditch. 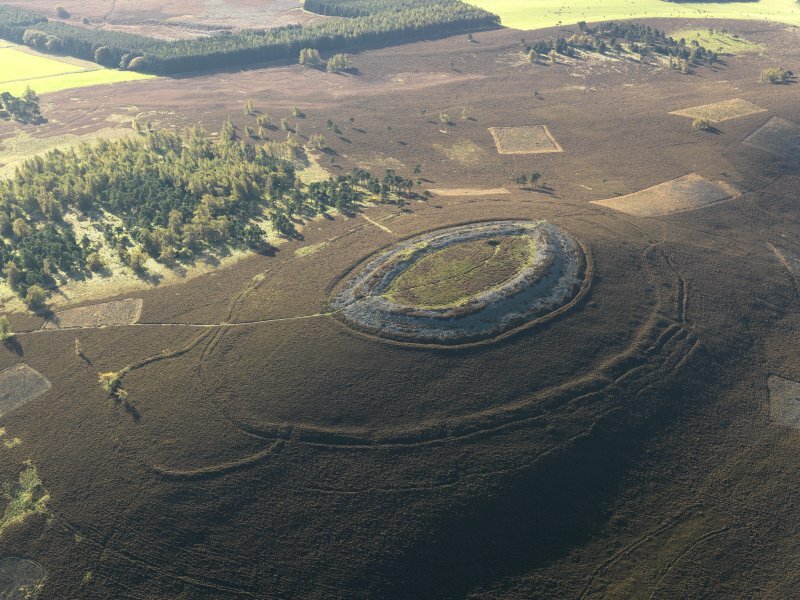 The entrance probably lay on the SE and the only features visible in the interior are an ancient well and a recent rectangular turf enclosure. At a distance of between 30m and 70m there is a further line of defence which, for the most part, comprises twin banks and medial ditch but on the N it is reduced to a single bank and ditch. There is an annexe on the E, and outside the outermost rampart on the NW there are traces of at least one interrupted ditch. Finds from the fort include leaf-shaped and barbed-and-tanged arrowheads, a stone ball, and two bronze flanged axes. Within the interior of the fort, partly overlain by a rectangular enclosure, there is an oval enclosure measuring approximately 39m by 34m with a groove about 1.5m broad by 0.3m deep. Visited by RCAHMS (SH) April 1983. 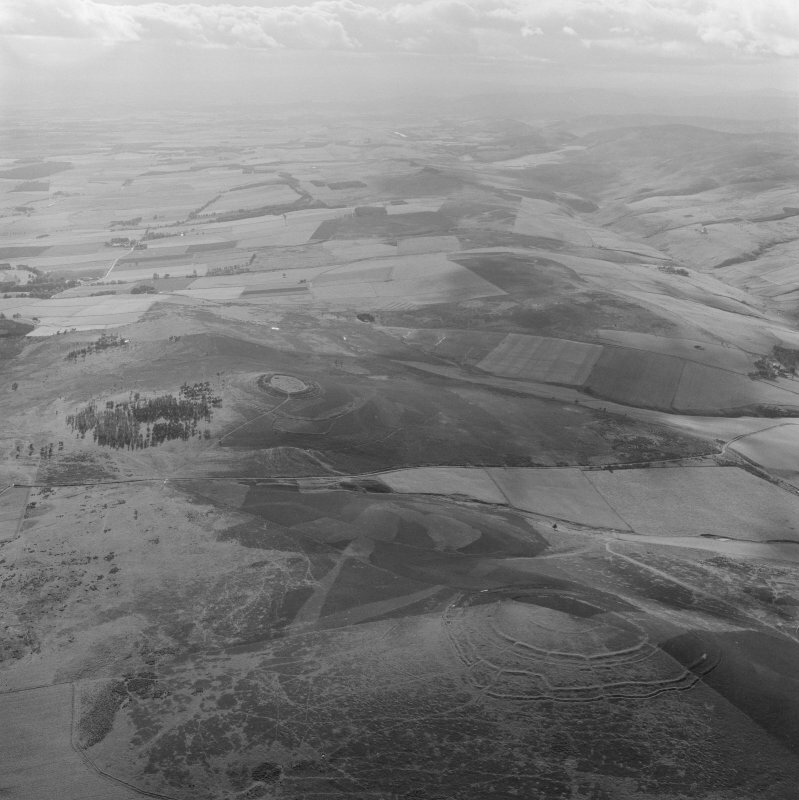 The remains of an oval enclosure lying within the ramparts of the hill fort were first recorded on RCAHMS aerial photographs. Surface remains consist of a shallow trench up to 0.7m wide defining an area measuring 39m EW by 35m NS. Sponsors: RCAHMS, Soc Antiq Scot. 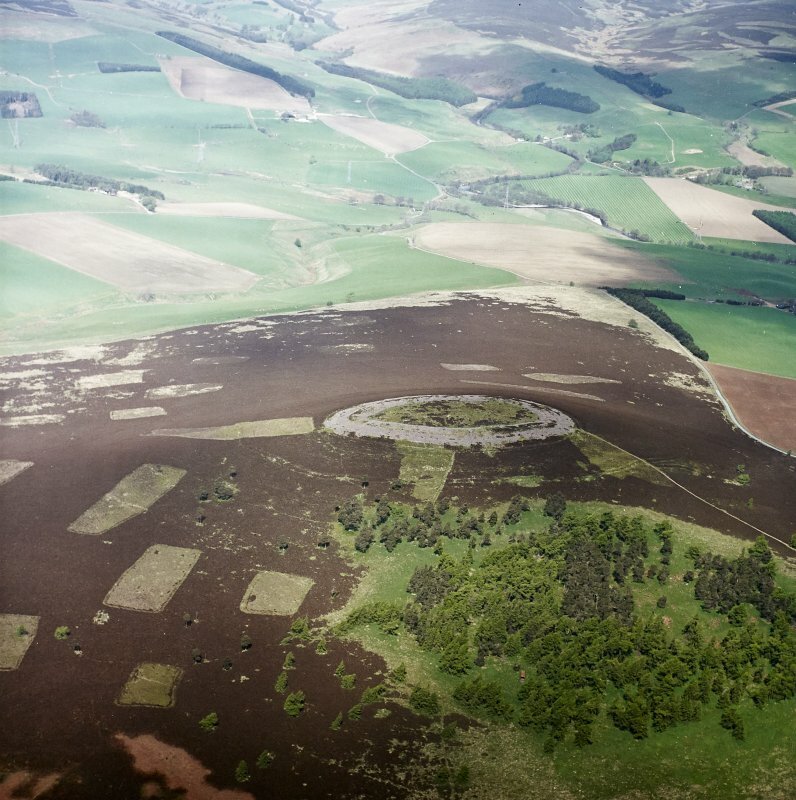 The White Caterthun is one of the most spectacular forts in Scotland, commanding a wide sweep of country from a low hill on the NW side of Strathmore opposite Brechin. Detailed survey of the earthworks has shown that the defences of the fort reflect several periods of construction, the earliest of which is a heavily robbed rampart (A) enclosing an area measuring about 335m from NE to SW by 210m transversely. Around the N quarter, where it is overlain by a later defence comprising double ramparts with a medial ditch, this early rampart is visible as a substantial terrace flanked by shallow quarry scoops along its uphill side. Elsewhere, however, it has been so heavily robbed that its course can only be detected from the flanking quarry scoops. A notable feature of this fort is the provision of numerous entrances; around the N quarter six original gaps can be identified, and others must have existed elsewhere. Roughly concentric to this early fort, set some 28m to 40m down the slope, there are traces of another line of earthworks (B). They are most easily identified around the W half of the circuit, where they comprise short segments of ditch with the spoil cast down the slope, but traces of a low scarp is visible extending their line immediately below the later ramparts (F) on the SE side. The date and purpose of these curious earthworks are unknown but it is possible that they are part of an unfinished line of defences supporting the early rampart (A). The extensive robbing of this rampart, which appears to have taken place at some earlier date than the construction of the overlying line of defence, can probably be accounted for by the construction of the massive stone fortifications at the core of the fort. These defences (C-E) are unrivalled for their sheer scale and must have entailed the collection of stones for some distance around. The mound of rubble from its inner wall (C) is about 20m wide and from 1.5m to 4m high, and the spread of stones beyond it (D) is probably the remains of a substantial outer rampart. Fronting this rampart is an impressive ditch with a counterscarp bank (E). A curious feature of these defences is that there is no obvious sign of an entrance. Causeways across the ditch on the SE and W are composed of tumbled stones, while the gap in the ditch on the SW may be the result of a relatively modern track shown on the first edition of the OS 6-inch map (Forfarshire, (1865), Sheet xix). On the E, however, immediately S of the modern path up to the fort, there are possible traces of an original gap in the earthwork, but there is certainly no evidence of a gap in the inner wall. The double ramparts with medial ditch (F) which overlie the early rampart (A), follow a roughly concentric course around the central stone fort and were almost certainly added as an outwork to it. Like the early rampart this line of defences has numerous entrances; there are thirteen gaps, of which at least ten are original, around the N quarter matching those of the earlier rampart. The annexe on the NE (G) was subsequently added to these outworks. Despite the scale of the effort that has been put into the construction of the defences, there is very little evidence of occupation within the earthworks. In part this may result from the episode of ridged cultivation that is detectable within the interior of the central stone fort. The most obvious features within the massive stone wall are a well at the SW end and a turf-banked enclosure on the NW. Beneath the turf-banked enclosure, however, there are traces of an enclosure some 37m in diameter, defined by a shallow groove in the surface of the turf. 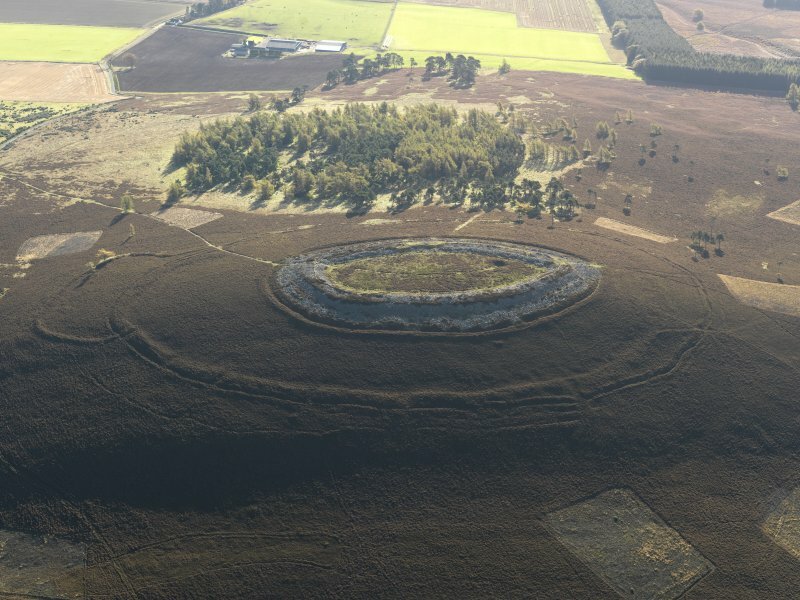 Immediately to the NE there is possibly a second enclosure, which measures about 23m in diameter within two grooves set 3m apart. The closest parallels to these enclosures are the surface remains of palisade trenches in the Border counties. Apart from these enclosures, the only other evidence of structures that stood within the earthworks are provided by eight shallow scoops that are strung out in a line between the stone fort and the earlier rampart on the SE, and a small platform in a similar position on the W. One of the scoops on the SE is probably a ring-ditch house, whose rear appears to be overlain by the counterscarp bank of the ditch that accompanies the stone fort. Three of the other scoops, however, appear to have been cut back into the counterscarp bank. 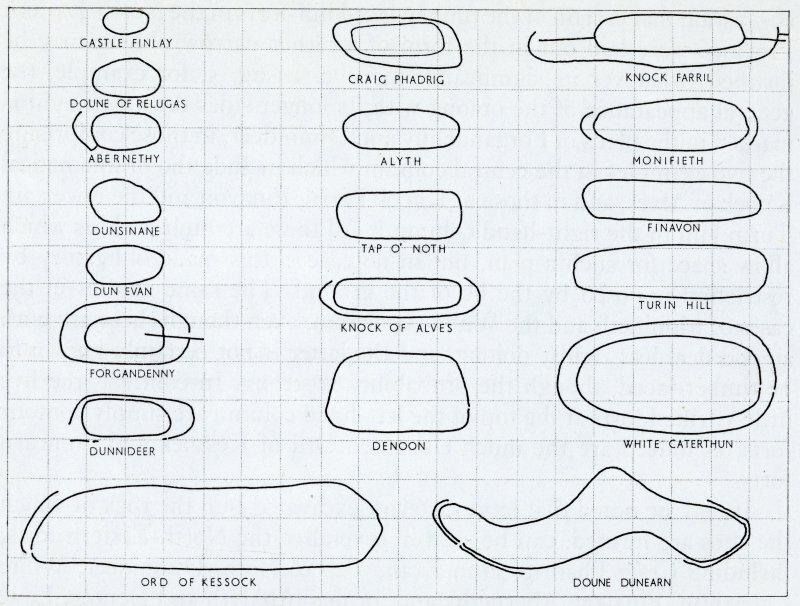 It is likely that all these scoops mark the positions of timber houses but it is not known if any of them relate to the occupation of the fort. Several other ring-ditch houses are scattered across the E flank of the hill outside the defences (NO56NW 43; NO56NE 32). In the absence of excavation, the dating of this site must remain uncertain. Visible on vertical air photographs (OS 68/054/174-5, flown 1968). 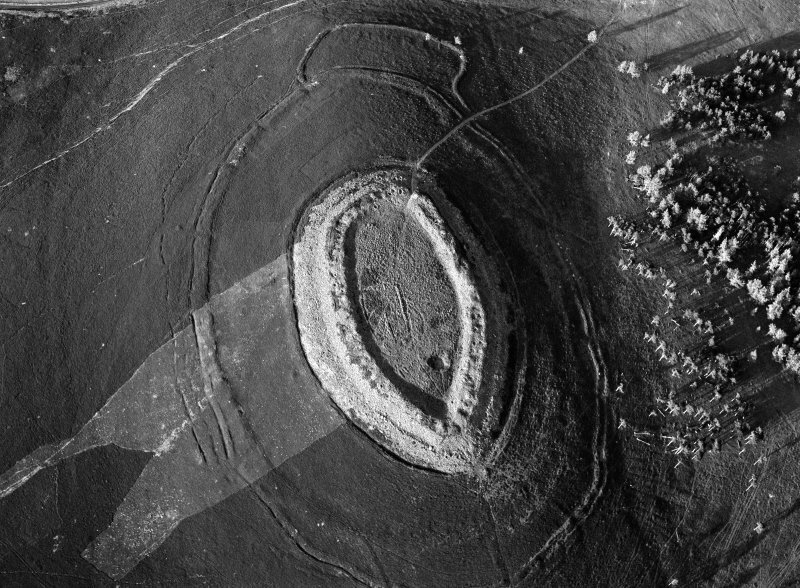 A survey of the effects of rabbit-derived erosion upon the earthworks was carried out in the summer of 1996. A report, containing a colour-coded map identifying areas of damage, was deposited in the NMRS. 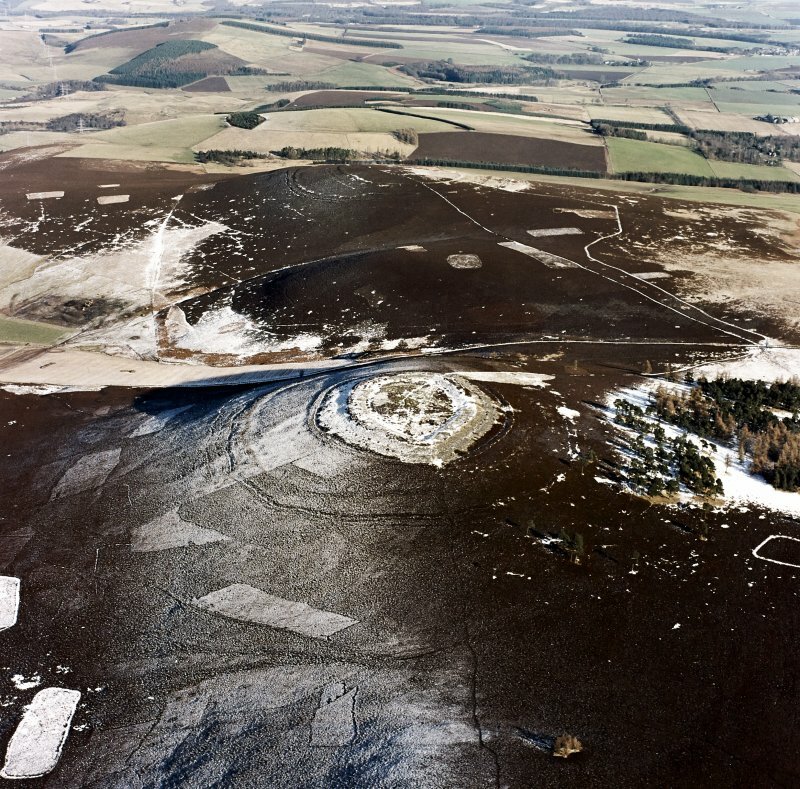 NO 5473 6607 Trenches were excavated in September 1997 across four separate rampart systems on the eastern slopes of the White Caterthun hillfort (NMRS NO56NW 17). 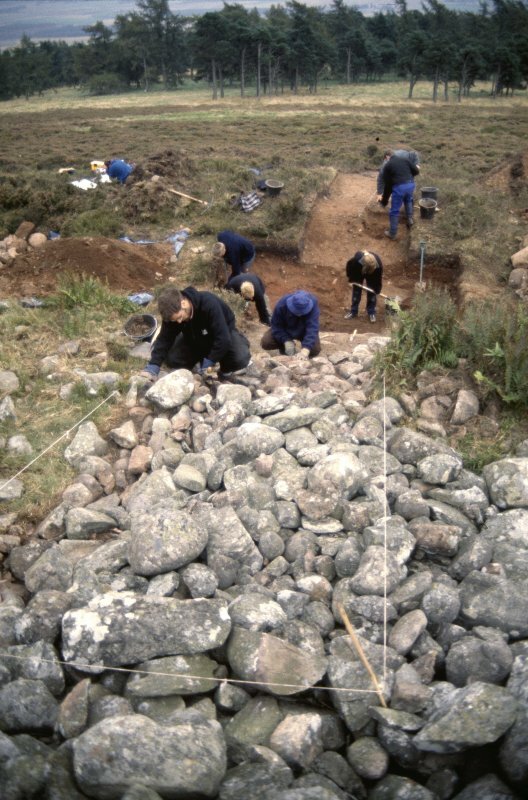 These excavations were a component of Edinburgh University's Angus and South Aberdeenshire Field School. The work was conducted partly in response to rabbit damage to the site and to provide data for comparison with that obtained from the Brown Caterthun (NO56NE 1) (Dunwell and Strachan 1996). Trench 1 was excavated across a section of rampart forming part of the annexe on the eastern side of the hill. The rampart was of simple dump construction, with a possible robbed-out external stone face, lying beside a rock-cut ditch c 3m wide by 2m deep. The vestigial remains of a counterscarp bank lay beyond this ditch. The area enclosed by the rampart was characterised by slight scarping of the subsoil upon which a rough cobble spread, which also extended up the inner slope of the rampart, was laid. Trench 2 was opened across the two outermost ramparts. Both ramparts were of simple dump construction and sealed old ground surfaces. A rock-cut medial ditch separated the ramparts, and a second rock-cut ditch lay downslope from and external to the outer rampart. The outer rampart appears to be the earlier and was constructed of redeposited subsoil from the medial ditch. Both ditches showed evidence of recutting. The secondary fill of the medial ditch comprised a thick deposit of turf which would appear to represent collapse from the inner rampart, which may have taken the form of a turf rampart revetted by a timber face situated in a continuous slot. Such a slot was located beneath the rampart base. A palisade was located running concentric to and external to the outer ditch. Trench 3 was located on the eastern side of the hill between the inner stone wall and the outer ramparts. 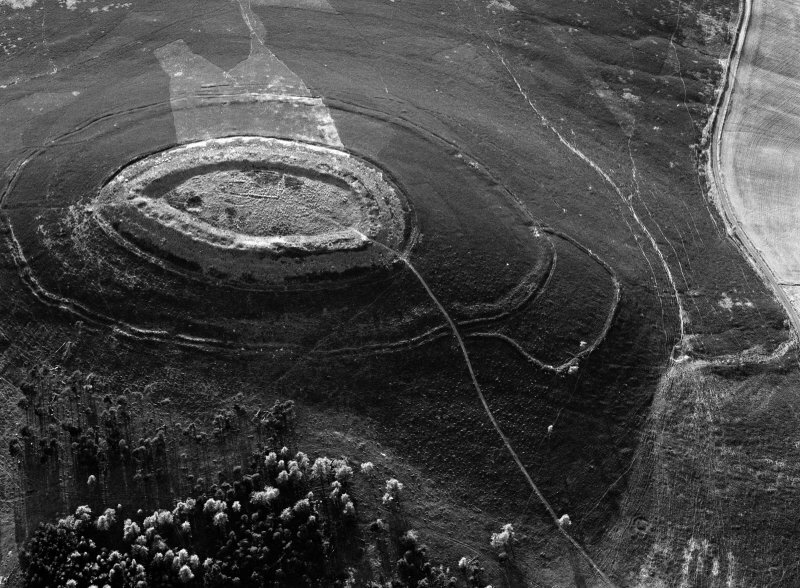 It was positioned across the alignment of reputedly the earliest and robbed-out stone rampart of the hillfort. No evidence for this rampart was located. However, three levelled areas formed by rubble and turf were identified; these appear to represent the remains of terraces. These features were sealed by a thick deposit of brown earth and may represent the remains of former cultivation terraces. Trench 4 was opened across the tumbled stone, ditch and counterscarp bank immediately external to the massive stone wall on the summit of the hill. This trench revealed a rock-cut ditch c 5m wide by 1.2m deep. A shallow and wide rock-cut palisade trench was located adjacent to the inner margin of this ditch, and had subsequently been sealed by the tumbled stone. External to the ditch lay a counterscarp bank sealing an old ground surface. This counterscarp bank appears to have been placed on a prepared terrace which also seals an old ground surface. Both the terrace and the counterscarp bank were cut by a secondary deep and wide palisade trench. It is possible that this terrace relates to the activity described in Trench 3. Finds were restricted to coarse stone tools. Samples were taken for environmental analysis and radiocarbon dating from all trenches. A full report will be lodged with the NMRS. Sponsors: Historic Scotland, Edinburgh University. R Strachan and J Hamilton 1997. Scheduled with Brown Caterthun fort (NO56NE 1). Information from Historic Scotland, scheduling document dated 15 March 2000. Plan and desrcription in 'The forts, "camps", and other field-works of Perth, Forfar and Kincardine', Proc Soc Antiq Scot 34 (1899-1900), 103-5. The inner walls of this fort remain as a tumble of boulders 0.3m in maximum height. Of the outer defences the inmost rampart stands 1.5m high in front of a ditch 0.6m deep. The outer double rampart is very slight and, on the west, very faint. It is best preserved on the SE where the banks lie 5.0m apart with a medial ditch 1.2m deep. The annexe on the NE has no ditch, and may be a later addition. The additional ramparts on the NW were not located. 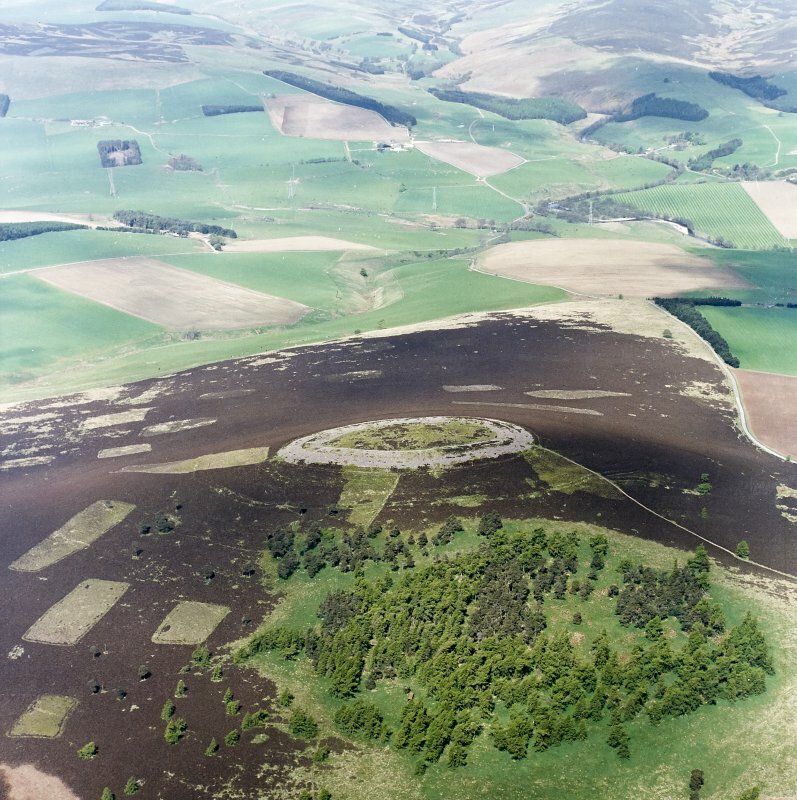 The interior of the fort is heather-covered, with the site of the well showing as a hollow 3.0m deep. The cup marked boulder was identified at NO 5467 6602. The broken pieces have been re-joined with metal clamps and it now measures 2.0m x 1.0m x 0.4m high and bears about 70 cups marks from 1" x 2" in diameter. 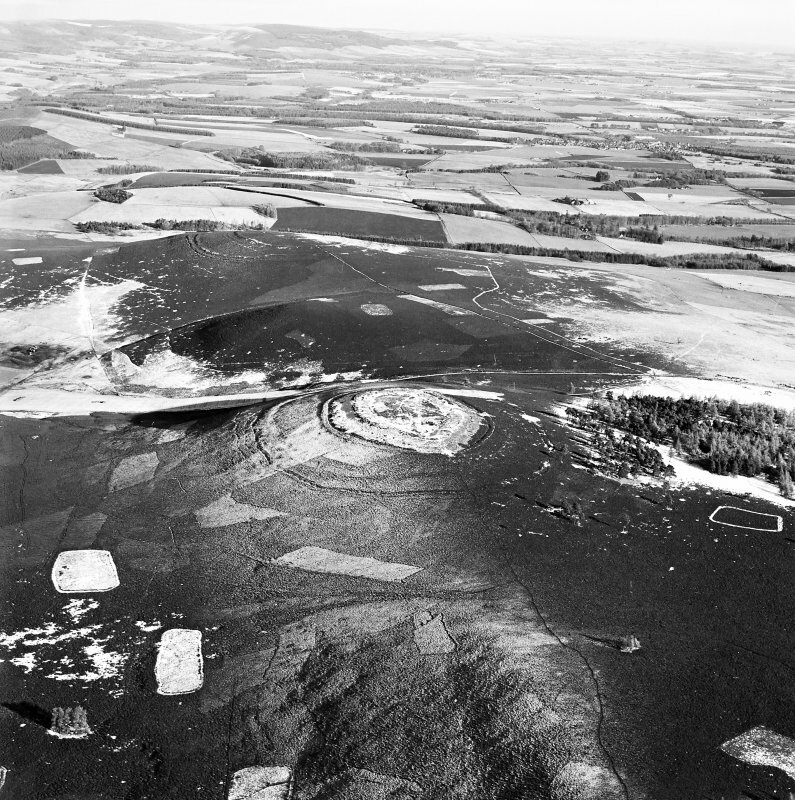 Oblique aerial photographs of White and Brown Caterthun forts, Angus, taken by John Dewar in September 1970. 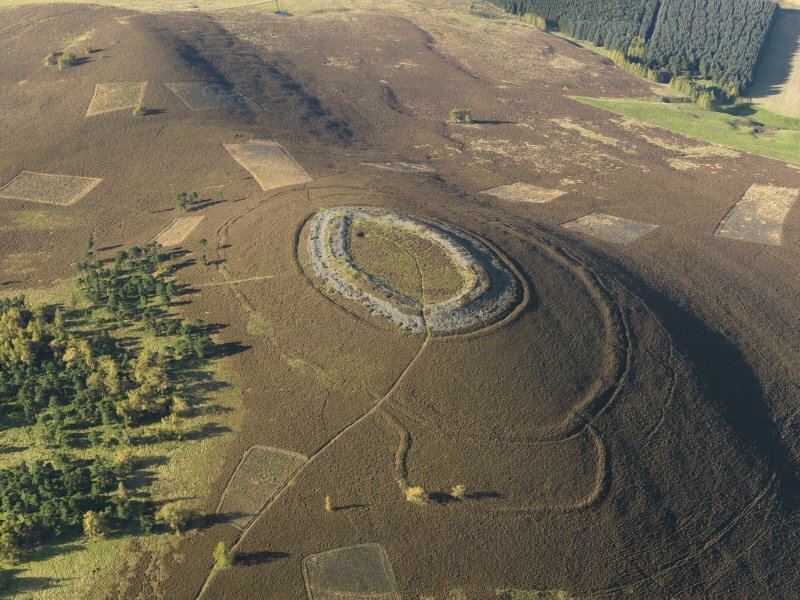 These two hillforts are impressive examples of prehistoric man's skills in engineering, using earth and stone to construct defensive ramparts and walls; like the great henge monument at Balfarg (no. 93) they illustrate a social order capable of marshalling a large work-force and considerable resources in terms of quarrying and timber. The Brown Caterthun occupies the broad summit of the hill, with the outer defences set a little below the actual hilltop. The most impressive of the several lines of defence is a wall about 7m in thickness, which encloses an area some 150m by 180m, and is now broken by nine entrances; several outer facing-stones can be seen, as well as stones of the entrance passages, particularly in the south-east flank. Within this fort there is a less well-preserved line of enclosure measuring about 90m by 60m internally. The main wall was additionally defended by double ramparts with a broad quarry ditch between them; breaks in the ramparts and causeways across the ditch line up with the entrances to the fort, and thus belong to the same period of defensive design. The outermost defences comprise two ramparts with an outer ditch and take in an area about 330m by 310m over all; the entrances through these ramparts do not in all cases line up with the inner suite, and thus it is likely that they belong to a later phase of occupation. The White Caterthun is crowned by a massive stonewalled fort measuring about 140m by 60m internally within a pair of walls, the inner measuring about 12m in thickness and up to 3m in height with the outer wall some 6m in thickness. Within the fort there is a rock-cut cistern at least 3m deep at the west end as well as traces of a rectilinear enclosure of no great age.Outside the fort further lines of defence can be seen, including a rampart with internal quarry ditch and further enclosing banks lower down the slopes. On the west side of the fort between the stone walls and the outer rampart there is a large boulder measuring about 2m by 1m, which bears about seventy cup-markings. 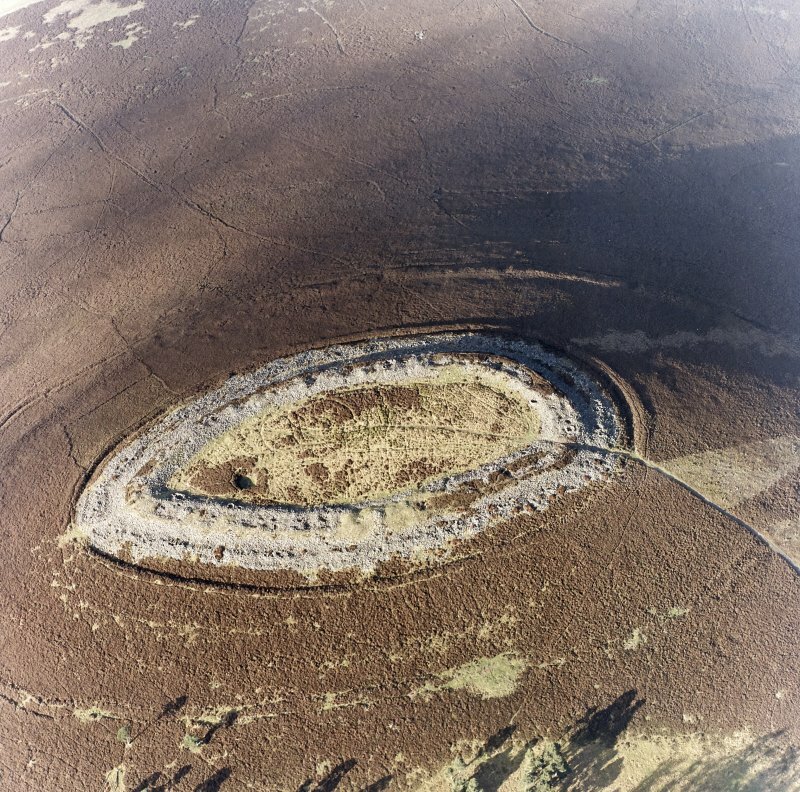 NO 5473 6607 Trenches were excavated in September 1997 across four separate rampart systems on the eastern slopes of the White Caterthun hillfort (NMRS NO 56 NW 17). 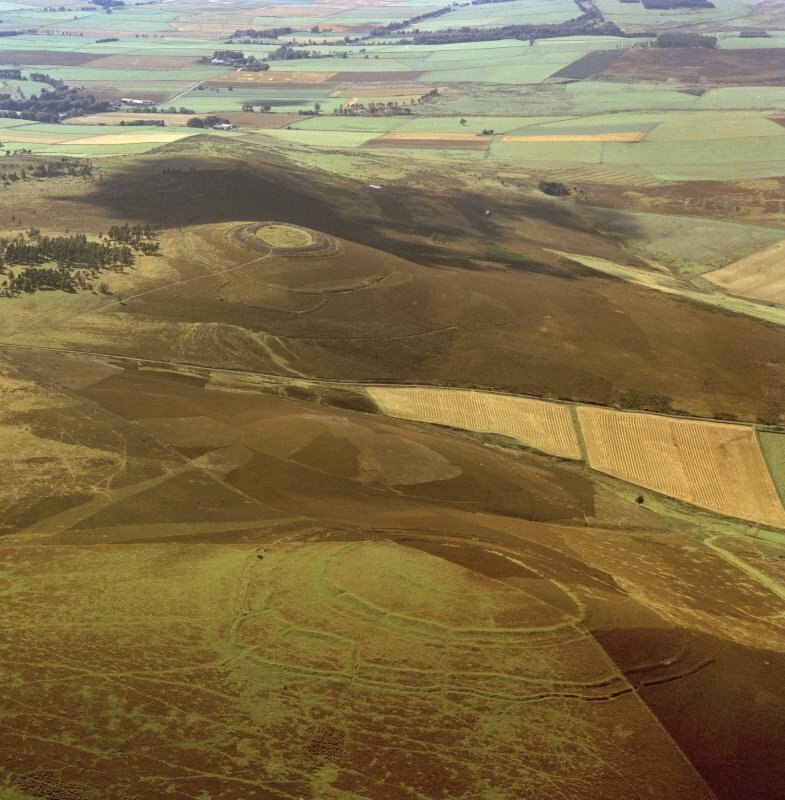 These excavations were a component of Edinburgh University's Angus and South Aberdeenshire Field School. The work was conducted partly in response to rabbit damage to the site and to provide data for comparison with that obtained from the Brown Caterthun (NO56NE 1) (Dunwell and Strachan 1996). The White Caterthun is one of the most spectacular forts in Scotland, occupying a rounded summit overlooking Strathmore from the chain of hills that includes the Brown Caterthun to the NE. 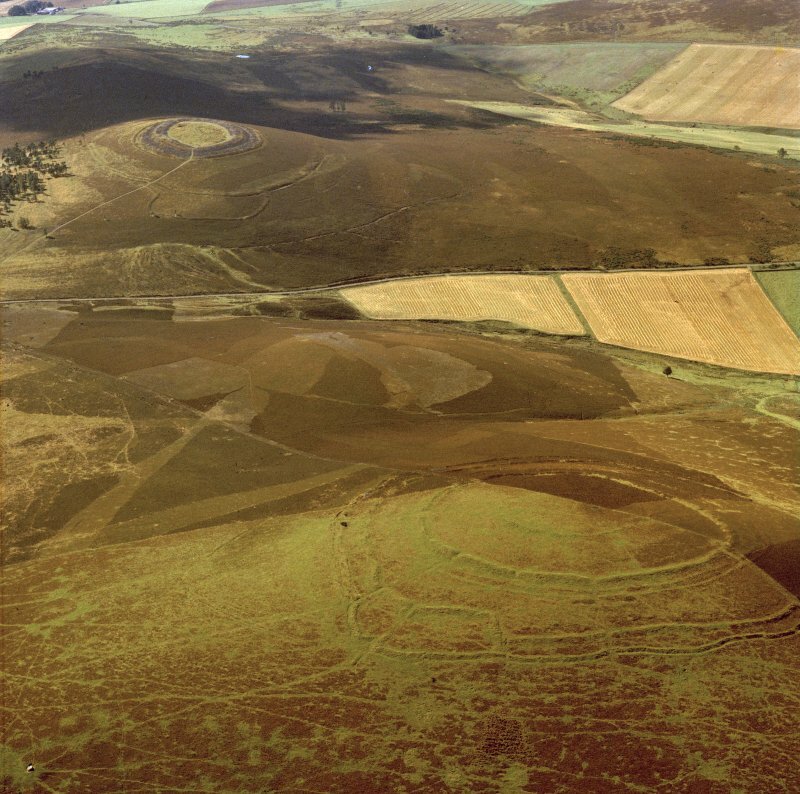 Its defences are disposed in four main circuits, the exact sequence and chronologies of which are not known, despite a progamme of small-scale excavations in 1997 (Dunwell and Strachan 2007). 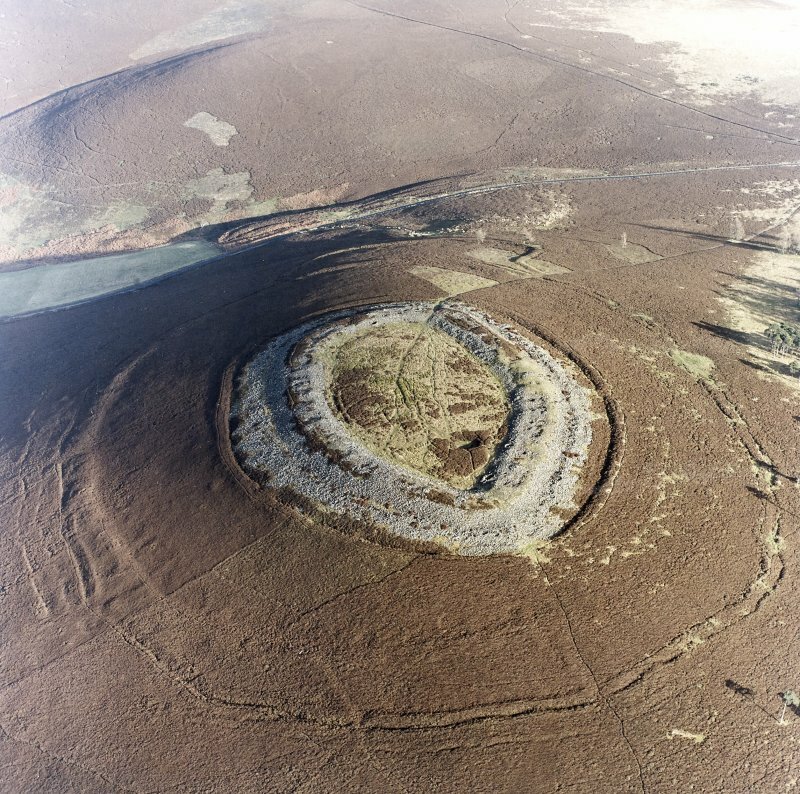 The innermost defences are assumed to be the latest, comprising a massive bank of rubble up to 20m in thickness and from 1.5m to 4m in height, which enclose a roughly oval area measuring about 140m from NE to SW by 60m transversely (0.68ha). The bank of rubble, in which small fragments of vitrifaction have been noted, almost certainly derives largely from a massive timber-laced wall, and though its external profile suggests that it may also incorporate an outer wall, an excavation trench across the broad encircling ditch and counterscarp rampart failed to locate any evidence of structure in the rubble tumbled across the inner lip of the ditch. Rather it uncovered a substantial palisade trench sealed by a deposit of hillwash that also extended down beneath the rubble across the primary fills of the ditch; a further complication revealed by this trench was the presence of a second palisade trench cut through the crest of the counterscarp rampart. This inner circuit is evidently more complex than its surface remains indicate and may represent several periods of construction. The lack of an entrance through the wall is a notable feature, though there is a possibly original causeway across the ditch where the modern path approaches from the ENE. The next circuit down the slope, has been almost entirely robbed of its stones, so much so that an excavation trench on the E could detect no trace of a wall or rampart on this line, but its presence is given away by the consistent pattern of quarrying to its rear, describing a slightly eccentric ellipse around the inner defences to enclose an area measuring about 335m from NE to SW by 210m transversely (5.5ha). One certain entrance can be identified on the ENE, and, apart from three other places where more recent tracks traverse its line, there are another eight gaps in its leading edge corresponding to entrances in what appears to be a later third circuit, six of them where the two follow almost exactly the same contour around the NW quarter. This third circuit of defences encloses a larger area again, taking in a total of 6.6ha lying concentrically around the innermost circuits. On the surface it appears as a rampart accompanied by an external ditch with a counterscarp bank, but a trench cut across its line on the E revealed an outer ditch, and beyond that a palisade trench; a second palisade trench was also found apparently sealed beneath the inner rampart, though it could not be demonstrated that this was not the timber face of the rampart. In all, this outer line is pierced by no fewer than thirteen gaps, and though four of these carry what are probably relatively modern tracks, there can be no doubt that there were originally entrances at regular intervals around the circuit, with a particular closely spaced series around the NW quadrant. The excavators chose to interpret these outer lines as elements of an unitary design, but there is no compelling reason why this should be the case, nor that the outer ditch, traces of which on the SE cross the axis of one of the entrances, is not part of the fourth and outermost circuit that can be traced around the whole of the NW half of the fort, forming an intermittent earthwork comprising short lengths of ditch and elongated pits with the spoil cast down the slope; a second line of pits can also be seen immediately up the slope on the NW. These have been interpreted as the remains of an unfinished line of defence. The final component of the defences, which overlies the third circuit on the NE, is an annexe measuring about 105m from N to S by 45m transversely within a dump rampart with an external ditch; it has a possible entrance on the E. The interior of the innermost circuit has probably been cultivated, but beneath the SW side of a rectangular turf-banked enclosure there are traces of a circular enclosure measuring 37m in diameter within a shallow groove, while immediately to the NE is a second measuring 23m in diameter with in twin grooves some 3m apart; the only other feature here is the mouth of a well at the SW end of the interior. Around the the SE flank of the hill, however, strung out in a row immediately downslope from the counterscarp bank of the innermost circuit, there are eight shallow scoops, one containing traces of a ring-ditch and possibly overlain by the counterscarp bank, which are almost certainly the stances of timber round-houses, though whether contemporary with the fort, or perhaps related to the unenclosed ring-ditch houses visible outside the defences on the E and NE, is not known.